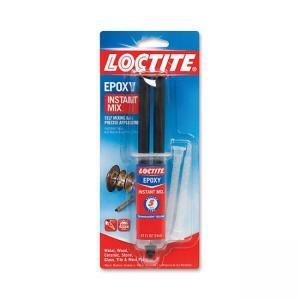 Self-mixing, epoxy syringe is a must for bonding jagged and poor-fitting surfaces. Two-part adhesive includes an epoxy resin and a hardener. When mixed in equal volumes, the resin and hardener react to produce a tough, rigid, high-strength bond, which starts to set in 5 minutes and reaches handling strength in 1 hour. The static mix nozzle delivers a uniform mixture of resin and hardener every time. It can be used as an adhesive for a wide range of materials or as a versatile filler for gap bonding, surface repairs and laminating. Use on metal, wood, ceramics, stone, glass, tile and most plastics. Epoxy does not shrink and is resistant to water and most common solvents. It can be tinted with earth pigments, cement or sand for color matching and can be sanded and drilled.